There is a powerful tool we can use to help people grow, heal, and cause lifelong change. It is called mentorship. Guest writer Dan Saint, Youth Director at the Mission Church, Appleton, WI, has written an article for us on how to do mentorship. 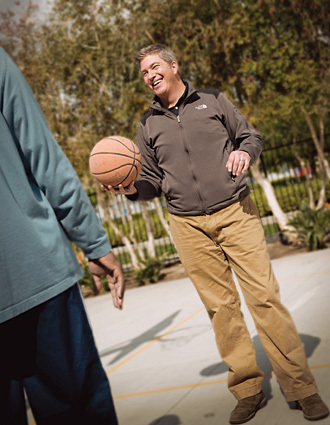 Dan not only has been mentoring students for all of his adult life, but he also experienced firsthand the benefits of it. Dan describes his mentor as a pivotal reason for why he was able to persevere and become the person he is today. He was able to ask his mentor tough questions about marriage, careers and life, and through spending time with his mentor he was able to see 1st hand how to navigate the troubled waters of life. There are people in the world that can learn from books easily, I am not one of them. The well documented learning style ‘learning by watching and then doing’ is the only one that people are actually born with. The rest are taught, and so mentoring comes into play. Mentoring is inviting someone that you value and see great potential in, to be a part of your life. This could mean someone on your sports team that you invite to practice with, instead of practicing alone. This could be a coworker that you take to lunch once a week or ask to help you with an important project. 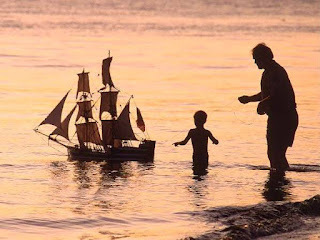 I have seen amazing mentoring done when a senior high student stuffs their annoyance with a younger student and shares life with them instead. Sharing the joys and pain of life has a cost, as do any truly deep relationships, but you will find life so much better when you share it. e. not necessarily a close friend but is a close confidant. R- Reliable, must demonstrate trustworthiness and handle basic responsibilities well. E- Excited, should be eager to be mentored and be a self-starter. A- Authentic, must be honest and willing to be real. D- Daring, must be willing to grow and be stretched and have an appetite for progress. Y- Young, must be willing to learn, to be teachable and open to receiving feedback and correction. If you want to be mentored or mentor, I could not more highly suggest reading “the Be With Factor”. It is full of helpful information and guides you through the important parts of being a mentor. Mentoring can be a life changing process. You could help a person turn a corner and achieve things they never would have otherwise, and have your own life changed in the process. Depression impacts over 30 million adults. Depression can be caused by a serious event like abuse, or illness, but it also can come on for no apparent reason or a chemical imbalance. Depression often causes people to withdrawal and isolate. Some times this looks like someone hiding in their room for days, not getting up to take care of themselves, or other times it is more hidden, and people keep it as an internal battle. This is different than just feeling sad temporarily. If you think you have depression it is important you seek help. Depression can be debilitating and seriously impact your work and home life. Counseling has shown to decrease depression by 85%. This means your situation can improve if you are willing to pursue help! For tips on how to help a love one with depression go to: http://www.webmd.com/depression/recognizing-depression-symptoms/helping-depressed-person. A sneak peak into my book on Grandparent Divorce! In this image (illustrated by Michelle Lund) Isaac is telling his toy cars/best friends that he was just told his grandparents are going to be moving to separate houses. 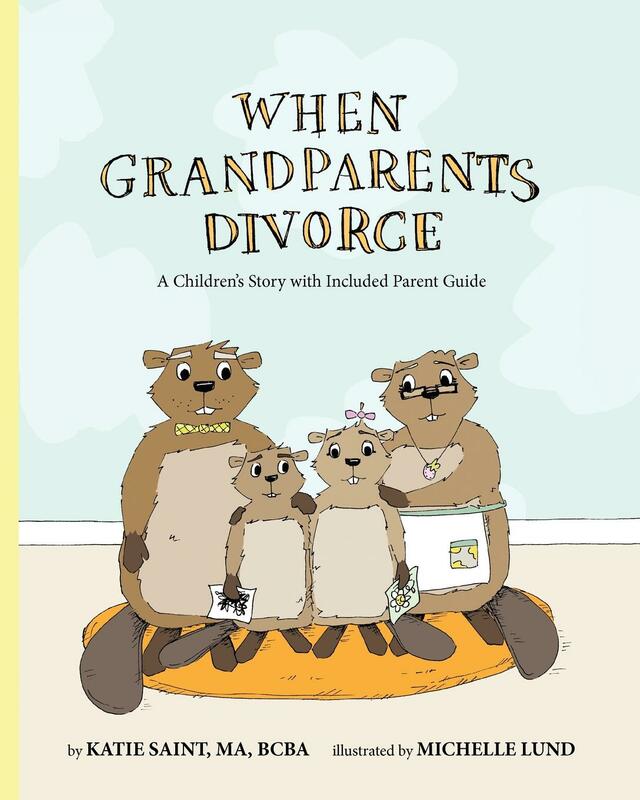 When Grandparents Divorce is written with a professional perspective through added Q&A for parents to aid them in understanding what are age-appropriate behaviors and reactions. This book will help parents have those difficult conversations with their kids (ongoing as things change), explaining the very confusing divorce of their beloved grandparents. It is meant to help kids see that the emotions they’re feeling are normal—and to help them understand what changes are happening with their grandparents. Most important aspect for the children is to understand that the divorce does not change either grandparent’s love for their grandchild. Children grieve in many different ways. Getting them to process that grief can be difficult. What kinds of behaviors are normal when children are upset about a divorce in general, not just grandparent divorce? How can I get my kids to talk about their struggles? 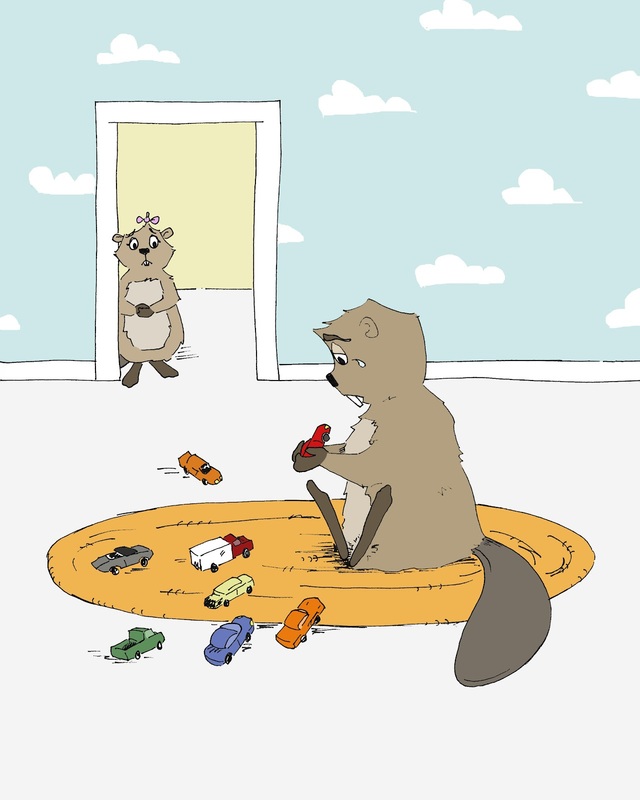 When should I tell my children about the divorce? Is it okay to cry in front of my children about the divorce? What do I do if my children are mad at their grandparents because of the divorce? When Grandparents Divorce will be for sale in late summer or early fall! At times connecting with your children can be difficult. Sometimes we don't know what to do, how to do it or even what to say. Sometimes talking to kids directly about tough issues is intimidating, and they often respond by shutting down. Playing games with children can bring their guard down, and provide them the time they need to get comfortable in order to open up. Reading a book that talks about what they are going through can help facilitate conversation as well. You can ask them questions in a gentle manor like, “Have you ever felt that way? Tell me about it.” The most important key to getting kids to open up is spending quality face-to-face time with them. What is unique about the activities I picked for this list is that you can easily talk while doing these things. Also if the conversation lulls, you can focus on the activity. This helps make both people more comfortable. The more comfortable some one is, the more likely it is that they will open up. Whatever your child is going through, it is beneficial for them to feel safe talking to you. They need to know with your actions that you are available and you care. Remember it is not a kid's job to pursue you. That is the parent's job. Time invested in a child is never wasted. Each mind set has the underlining fear of rejection. While your fears are valid and there is a chance of being rejected if you act real, your chances of rejection are higher by faking it. Ironically people encourage being rejected by putting on a show. People value authenticity and can sense when someone isn’t. Often our actions caused by insecurity, lead to our fears actually happening. For example if you are uncomfortable in a social situation, you might start withdrawing and even act awkward. This often leads to being/feeling like an outcast, confirming your initial fear. My challenge for you today is to deny the urge to hide and just be real. See if you actually get rejected. Perhaps you just might connect. Your chances will certainly go up. If you are having a difficult time trusting people counseling can help you to heal from that. Don't be afraid to reach out. 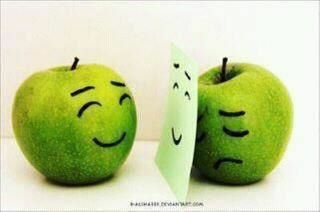 Some people have been hurt deeply by someone they loved and trusted. Healing from a wound like that can be difficult and often times takes help. The good news is you can learn to trust and have meaningful relationships again. There is hope. Being a good listener is important for friendships and it is very helpful for people who are hurting. Many times people ask me how they can help their friends and the number one answer is just to be a good listener. Simply letting your friends talk can help them heal from their pain and feel more equipped to face the day. 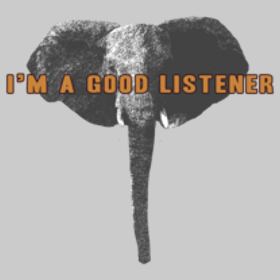 The world needs more good listeners!! What do you think you are going to do? Many people are not sure when to go to a counselor. A common myth is that you only go if you are crazy, or if things are really bad! Good news! Healthy people go to counseling too! Below is a list of items that a counselor could help with. It does not include everything counselors do but it's a pretty good start. Getting help always takes courage but people rarely regret it in the end. Transitioning through a major life event such as a big move, divorce, death of a loved one, loss of a job, loss of a relationship etc.. The great thing about counseling is it is confidential. If you are hesitant to come because of the stigma around counseling, no worries. Counselors are ethically bound to keep your information a secret. No one has to know you are there and if you feel like you are not getting anything out of it, you can quit at any time. There are no risks involved. I am not going to lie. I had a rough week last week. It was one of those, “I’m not sure I can get out of bed and face the day.” sort of weeks. On top of the stressors that I am still trying to work out in myself, my husband worked way more than normal, our pipe broke and we had sewage in the basement, my youngest son was regressing with his potty training and I was still anxiously waiting for the results of my Behavior Analyst test. I was not handling this stress well. By the end of Monday I was so stressed that I was begging my husband not to attend his men’s group so he could stay home with me and listen to me melt down. And melt down I did. I cried, I vented, and I basically embarrassed myself. Fortunately my husband lovingly and patiently listened in a non-judgmental way, hugging me all the while. Tuesday was a significant improvement on Monday. My vent session with my husband gave me enough dopamine (a chemical that gets released from spending time in healthy relationships) to motivate me to utilize my other coping skills. I got back into my regular workout routine, prayer life, and doing things that line up with my values. All of those items gave me dopamine. You see the buildup of stress decreased my dopamine to a disabling level, but the exercise, relationships, and doing things that line up with my values gave me dopamine back. It took all the way until Friday before I felt back to normal again. I can confidently tell you that even on Friday I would not have felt better if it weren’t for the intentional time spent trying to boost my dopamine. Some of my stressors got resolved but some definitely didn’t. They still hang over my head as I try to process them but I can fully function again. So remember next time you feel like you are not coping and life is really overwhelming there are practical things you can do to help get yourself out of that spot. Great chart to help you recognize the difference between physical hunger and emotional hunger. Thanks www.thelondoner.me! 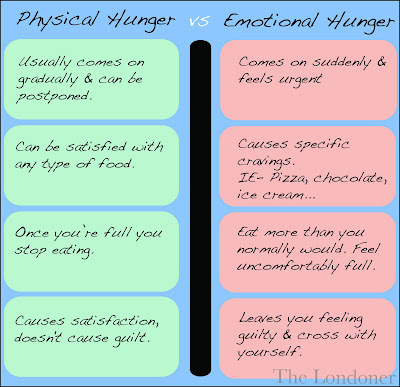 Remember eating emotionally is a quick fix, and leads to more negative emotions. Find healthy alternatives when you are craving food to fix an emotion like exercising, calling a friend, going on facebook, listening to music or reading a book.